The New Avengers' short run had a detrimental effect on its transition to the comic world. Unlike the notable runs received by the original Avengers and its characters in everything from annuals, to periodicals like Diana, to full-fledged comic books, The New Avengers' comic presence in Britain and Europe was limited to strips published in the series’ two annuals, and a French collection. Two stories ran in each annual, and two of those, plus an additional four, were included in the French collection, making for a total of eight stories. A ninth was scripted, but never illustrated. However, The New Avengers still sold well internationally, and was broadcast around the world in the late seventies and early eighties. China, however, was not one of the 120 countries to screen the series in its heyday. The “Iron Curtain” prevented the broadcast of foreign television in the country. The Chinese market would not fully open up to foreign series until 1985, and the original Avengers series did not garner an airing until the late 1980s. Therefore, The New Avengers' Chinese premiere did not occur until 1990, when it was dubbed in Chinese and aired on TV channel Zhejiang Television under the name The Three Detectives. Even then, only 16 of the 26 episodes were transmitted. This late airing meant late merchandising as well, in the heretofore unknown form of officially-licenced Chinese New Avengers comics. Published as an eight volume series by publishing house Renmin Meishu Chubanshi, each volume contained two stories adapted from the episodes aired in China. While many of the New Avengers comics published in Britain and France were also based on the episodes’ storylines, these comics stuck even closer to their source material, often reproducing scenes exactly as they appeared onscreen. These comics did not come to light until early 2014, due to the tireless research of Steedumbrella webmaster Denis Kirsanov. The artwork and likenesses are of variable quality, but are really no better or worse than most of their British and European counterparts! The standouts are the eyecatching watercolouresque covers, bursting with action and energy. The comics are an amazing discovery, proving once again that it is still possible to discover new things about the series even forty years on. Anew, in partnership with Steedumbrella, is pleased to offer all of the Chinese stories for your persual. Prolific thanks go to Denis Kirsanov for discovering these gems, and for providing Anew with scans of the comics. The comics can also be found on Denis’ site. I hope all New Avengers fans enjoy them as much as I have. Comics published in English in New Avengers annuals. The Midas Touch: Adaptation of the episode The Midas Touch. A gold trafficker picked up by the Avengers points them to the services of a mysterious Midas. When Purdey investigates, she uncovers an assassination plot and a deadly secret. Fangs for the Memory: When two Ministry men working in Optics are found dead with puncture wounds to their necks, the unlikely explanation seems to be vampires. But as Steed, Gambit, and Purdey investigate further, they find the murders are grounded in reality. Could ex-Optics man Martin Count be involved? Hypno-Twist: A hypnotist at a party attended by Steed, Purdey, and Gambit puts a man in a trance and sends him on a harmless errand, only for the man to wind up dead. Investigations ensue, and it becomes apparent that the man inducing in the trances was not all he seemed--and wasn't working alone. Diamonds Are For Evil: The script for an unmade New Avengers comic, it was written in the seventies by Steve Moore for inclusion in one of the The New Avengers annuals. Published in Stay Tuned Volume 3, Number 10, it concerns the theft of a valuable diamond, formerly owned by Cleopatra! Stories published only in French. The Curse of Falkenstein (English or French): The first of the French comics. When Gambit disappears, his girlfriend enlists the help of Steed and Purdey. Their search leads them to a mysterious village, and, ultimately, a deadly plot involving a nuclear power plant. Featuring a very dodgily-drawn Gambit! The Mystery of Planet Y (English or French): Adaptation of the episode The Tale of the Big Why. A prisoner due for release claims to be in possession of valuable information. 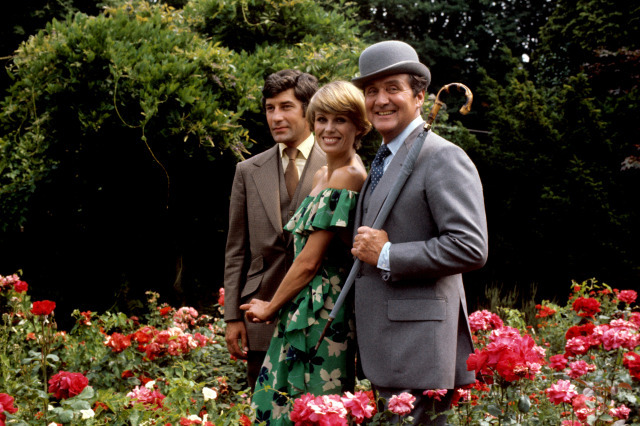 The search for it leads Steed, Gambit, and Purdey on a merry chase, and may uncover a traitor in their ranks. Episode adaptations published in China. 捣毁鹰巢(Destroy Eagle Nest): Based on the episode The Eagle's Nest. 超级机器人 (Super Robot): Based on the episode The Last of the Cybernauts...??. 鸟中之王 (The King of Birds): Based on the episode Cat Amongst the Pigeons. 模拟靶场 (Analog Range): Based on the episode Target! 真假难辨 (True and False Difficult Distinguish): Based on the episode Faces. 三人游戏* (Three Handed Game): Based on the episode Three Handed Game. 昏睡不醒 (Lethargy): Based on the episode Sleeper. 神秘下水道 (Mysterious Sewer): Based on the episode Gnaws. 先知女巫 (Prophet Witch): Based on the episode Medium Rare. 执迷不悟 (Unrepentant): Based on the episode Obsession. 死亡天使 (Angels of Death): Based on the episode Angels of Death. 独角兽 (Unicorn): Based on the episode The Lion and the Unicorn. 猛虎初醒 (Tiger Awakes) and 虎落平阳 (Hardships): Based on the episodes K is for Kill, Parts 1 and 2. 角斗士 (Gladiators): Based on the episode The Gladiators. 前方基地 (Forward Base): Based on the episode Forward Base.